If you haven't yet heard of "trenchless plumbing" - that is probably because you haven't had to deal with any repair of your sewer system or have not had to deal with broken pipes under concrete floors or driveways, etc. Trenchless pipe repair is basically the process of replacing a broken pipe in the ground with a new pipe without having to dig up the old one or break through any concrete or other construction that the pipe may be laying under. This is a great time and money saver for the property owner. Not only does the yard or floor NOT have to be destroyed (and later repaired) but the amount of time it takes to make the repair on the pipe is greatly reduced. It's a win-win! However, it's important to know that the trenchless method cannot be used in every single situation. There are situations where this process is not appropriate. If your pipes are old, corroded, show significant amounts of cracking. If your pipes are thin. If part of the pipe has collapsed. If the pipes are not buried properly (if they are not deep enough). A discussion with your plumber (along with his inspection) will help you to determine if the trenchless method can be used to repair your sewer pipes. So, exactly what does trenchless plumbing involve? Essentially, the trenchless method offers two possible options to repair broken pipes. Pipe Bursting - which is the process of inserting new pipe into the old pipe and then pushing it through. Pipe Lining - which is the process of pulling (or blowing) a flexible tube (coated with resin) into the old pipe and then inflating it. The resin will then harden and create a "new pipe". The plumber will conduct an inspection using a sewer camera. This will show the type and extent of damage in the pipe / sewer system. The second step then is to clear out the pipe with a hydro jetter or auger snake. Finally, the trenchless process begins to essentially create a new pipe which repairs the old one. This non-invasive sewer line repair process is perfect for situations where the pipes that need repair are under lawns, driveways, concrete sidewalks and other surfaces that are costly to repair if they are destroyed as is the case often with traditional methods of sewer repairs. How Long Does Trenchless Sewer Repair Last? Generally speaking, if you have had any of your water or sewer pipes replaced with the trenchless method, and the process was done correctly, you can expect the repair to last anywhere from 50 to 100 years. That gives you an excellent return on your investment. The cost for trenchless sewer repair will vary depending on a variety of factors but we can tell you that on average, the cost is about $160.00 / foot. This is less expensive than traditional pipe replacement methods. When it comes to any sewer repair (trenchless or traditional) the factors that end up being the most expensive are the landscaping issues. Uprooting existing trees, bushes, etc. and any damage done to the lawn. The other major expense in traditional sewer repair are any costs incurred from repairing driveways or patios or even flooring in the home if the broken pipe sits under these. A trenchless system eliminates this cost. An easy way to replace pipes beneath driveways, patios, etc. With all it's advantages, we do have to acknowledge that there are times when it's simply not possible to use the trenchless system - there are occasions where the pipe is so irreversibly damaged and corroded that there is no choice but to dig it up entirely and replace them. 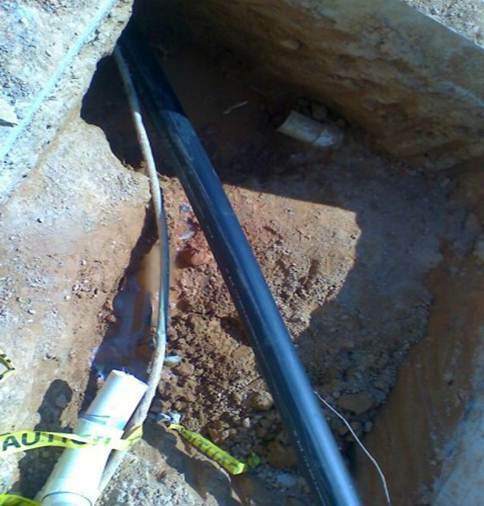 If you have any questions about trenchless sewer repair, call Atlantis Plumbing today at 770-505-8570. We are available 24 hours a day, 7 days a week.